This has been a strange week at work with announcements of possibly big changes ahead in our department and plenty of work. Sleep has not been super easy with so much on my mind and I get a little cranky when I’m tired. I understood road rage a lot more this morning when a teenager in an Expedition was too busy devouring breakfast to check his blind spots before changing lanes and nearly sent me into a light post. Silly kids. But seriously, California, can we make a hands free law for fast food too? Okay, I’ll end my whiny, sleep-deprived ranting and get back to positiveville with this beautiful salad trio from Baagan. They’ve added a new salad trio to the menu that will be rotated with different salads weekly because I wasn’t already addicted enough to their food! 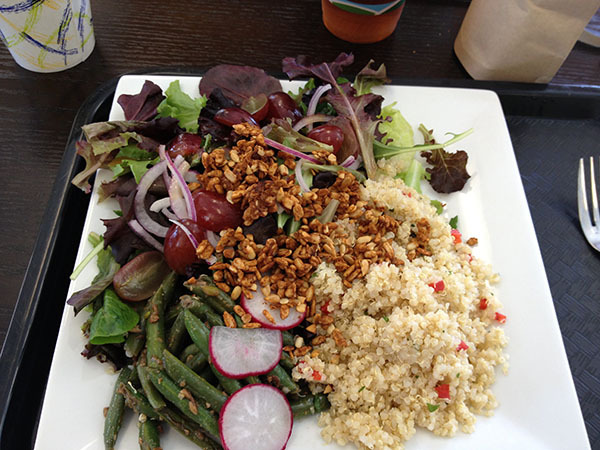 This one has a spicy Indian green bean salad, cilantro lime quinoa, and a spring greens salad with mango vinaigrette. I loved the combination of unique flavors and already looking forward to the next trio. After a long day today, I wanted to keep dinner simple. But somehow didn’t once I got creating in the kitchen. 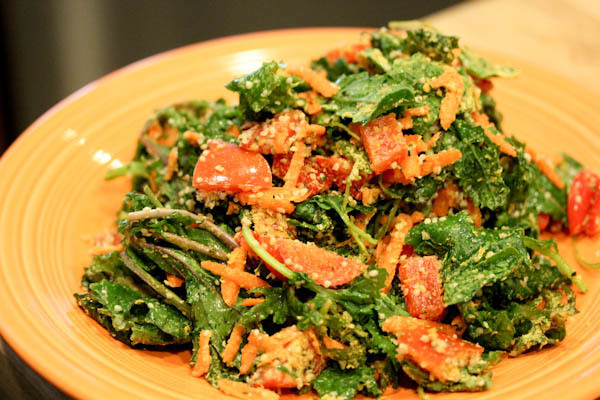 I started with the lemon kale salad from Raw Foods on a Budget which is a simple blend of massaged kale, nutritional yeast, hemp seeds, and other seasonings. But then I added shredded carrot, chopped tomato, and chopped red pepper. Then a dash of lemon pepper seasoning for more kick and ended up with this salad monster. And it was a delicious combo! Good thing I have plenty of leftovers for a simple lunch tomorrow. 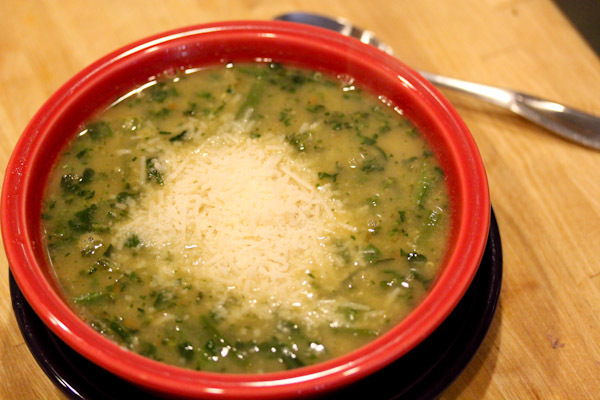 Last night I got a little more creative making a warm and comforting quinoa and split lentil soup. 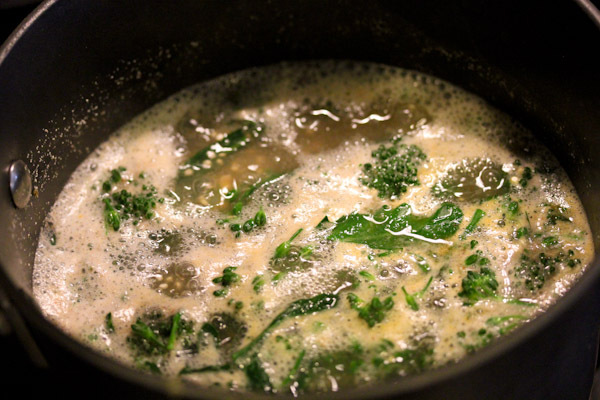 Bring veggie broth, quinoa, and lentils to a boil in a large soup pot. 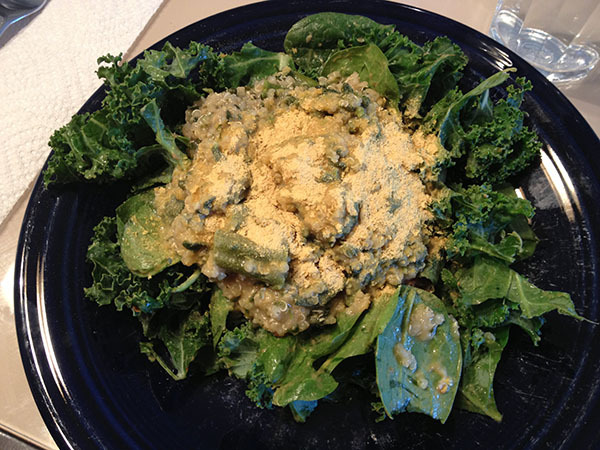 Add broccoli, spinach, garlic powder, onion powder, nutmeg, and nutritional yeast and reduce heat to a simmer. Add salt and pepper to taste and serve. Makes 4 servings. I don’t think I’ll ever tire of lentil and quinoa stew, they’re cheap staples to keep in the pantry that make a hearty, one-pot meal fast with endless flavor possibilities. I topped a huge bowl of the stew with Trader Joe’s Vegan Mozzarella Shreds for a comforting meal. The nutmeg added a nice warmth to this savory and hearty blend and the broccoli was cooked, but not too mushy adding a nice texture. Split red lentils cook much faster than other lentils and turned into mush blending into this stew which was a good thing because they added a creamier texture and better blended flavor. The leftovers of this stew worked great the next day too served chilled on a bed of spinach and kale. I make your dressings all the time, but now I’m going to make that stew! 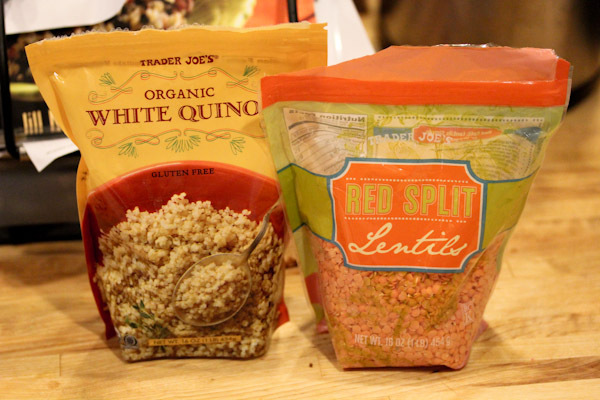 I’m always looking for something good for red lentils, and this seems perfect.